Stoneware, raised-relief decoration. 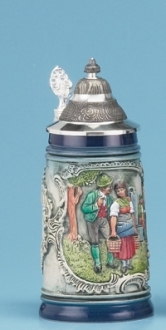 The degree of detail in this stein is truly exceptional. The stein features selective hand painting of the three main subject areas and careful application of background washes, border bands, and glazing. In the main scene we see a hunter greeting a couple of ladies and in the side panels we see snapshot bar scenes. Relief conical pewter lid.